Solutions that meet your performance and budget requirements. Click on the Product Information banner below for availability and up to the minute pricing. If you need a custom quote, call or submit your request. BBC is an authorized HPE Renew Reseller, contact our sales team directly for a custom quote. Visit our used and refurbished store. Can't find what you want? Check our Online Catalog. Whether you are looking for new, refurbished, or hard to find parts, BBCUSA can help you find it. 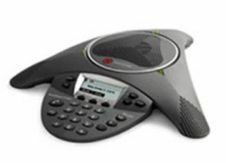 Polycom conference phones deliver the superb voice quality, expansive microphone pickup, and advanced audio processing that makes conference calls seem as natural as being in the same room. Building Block Computers can supply the SoundStation Conference Phones as well as Polycom Power Supplies and Accessories to meet your requirements.